Two genetics, development and cell biology (GDCB) graduate students received first and third place awards in the 2018 Loomis and CBC Symposium Student Poster Competition. GDCB’s Trevor Nolan (right) won first place in the competition, while GDCB’s Carla Mann (center) won third place. A Department of Biochemistry, Biophysics and Molecular Biology student, Xinyu Fu (left), won second place. 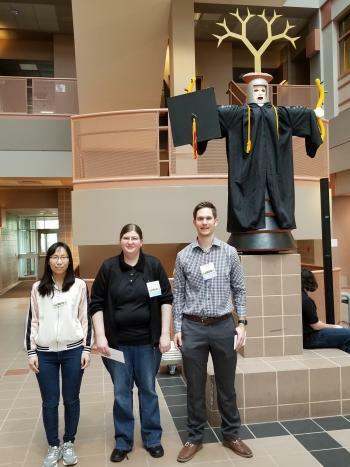 Two genetics, development and cell biology (GDCB) graduate students received first and third place awards in the 2018 Loomis and CBC Symposium Student Poster Competition, which was held in May. Trevor Nolan won first place, while Carla Mann received third place for her poster. Xinyu Fu in Basil Nikolau’s lab in the Department of Biochemistry, Biophysics and Molecular Biology won second place. BBMB Assistant Professor Dipali Sashital served as head judge of the poster competition. The title of Nolan’s poster is “Network-Based Discovery of Brassinosteroid Regulation of Plant Growth and Stress Responses in Arabidopsis.” Nolan said, “This research aims to understand how plant steroid hormones called Brassinosteroids regulate thousands of genes to control plant growth and stress responses by using a combination of computational biology, genetics, genomics and high-throughput phenotyping.” View additional details about Nolan’s poster in the poster abstract. Nolan’s major professor is Yanhai Yin, GDCB chair and professor. Nolan’s poster also won first place for the Biochemical Journal Poster prize award ($200) at the 3rd International Brassinosteroid Conference, which was held in August in San Diego. Yin served as chair of the event. The title of Mann’s poster is “The Gene Sculpt Suite of Computational Tools for Precision Genome Editing.” Mann said, “The Suite comprises three tools for assisting in precision genome editing experiments: MEDJED (Microhomology Evoked Deletion Judication EluciDation) predicts the extent to which a DNA double-stranded break site will undergo microhomology-mediated end joining; MENTHU (MMEJ kNockout Target Heuristic Utility) recommends DNA target sites like to have a single predominant repair outcome; and GTagHD (pGTag Homology Design) designs oligonucleotide guides to assist in high precision gene knock-ins.” Mann’s major professor is Drena Dobbs, University Professor. In addition to receiving an award in the Loomis poster competition, Mann won first place in the 5th Annual Graduate and Professional Student Research Conference, which was held in April.